Stand a chance to win a R500 betting voucher in our latest horseracing Facebook promotion! This competition will run from Wednesday, 5 December 2018 – Friday, 7 December 2018 at 08:00am. Entries must be received by 08:00am on Friday 7 December 2018 (the “Closing Date”). To enter the competition, the contestant must answer the following question correctly. What do you need to do to enter the current Horseracing competition? The comment must put it in the comments section of the post on the Hollywoodbets main Facebook page. 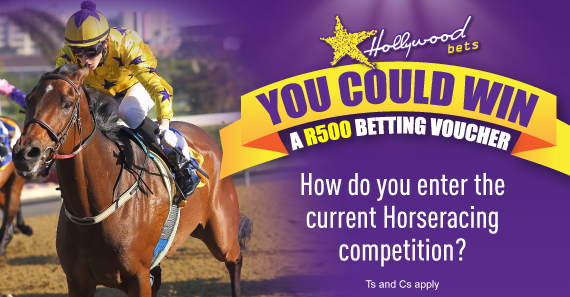 The prize will be a R500 betting voucher that will be deposited into the clients activated Hollywoodbets account, if the client does not have an account they will need to register and FICA the account before the amount is deposited. The winner will be announced on Friday 7 December 2018.